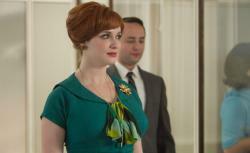 Mad Men review: Joan and Peggy make shocking decisions. Mad Men is the kind of show where you know any character can get the hook at any time. But Peggy Olson? She has been, since the show’s inception, one of its three or four lead characters (and perhaps its most sympathetic one). And now she’s off, leaving Don and SCDP and the Jaguar account behind for Ted Chaough and $19,000 a year and a chance to prove her worth. What was the final indignity, the insult that sent Peggy running? Perhaps it was when Don threw money in her face after she won a bit of new Chevalier Blanc business. Or perhaps it was watching the agency boys eat lobster from the Palm while she slaved away on Secor Laxative and the other unglamorous accounts. Or perhaps it was the years of abuse from Don, who has been taking her for granted in ways big and small. When you think about it, we’ve witnessed so many reasons for Peggy to make this decision—culminating in last week’s episode implicitly comparing SCDP to a cult—that perhaps we should cheer Peggy’s resolve in breaking with her charismatic leader. Certainly the exhilarating closing music—the Kinks’ “You Really Got Me”—brought the episode out on a high note, suggesting that Peggy is movin’ on up to bigger things, to a place where she’ll no longer be seen as “some secretary from Brooklyn who wants to help out,” as Freddy Rumsen put it. But I’m sad to see her go. And her final goodbye with Don—her proffered handshake, the moment when it seemed he might reject the overture, and then his tender, strangely chivalric kiss—had me weepy. Goodnight, office. Goodnight, room. Goodnight, Peggy, jumping over the moon. Joan, meanwhile, has finagled a place at the partner’s table, by way of a sordid assignation with Herb from the Jaguar dealers’ association. The incident smeared muck onto everyone who came in contact with it, including Cleopatra, Helen of Troy, and various sultans of Araby. It made Pete look bad, for pushing the idea. (How Pete-ishly slimy was his initial insinuating approach?) It made Bert look bad, for ineffectually saying “Let her know she can still say no,” and washing his hands of the matter. It made Lane look bad, for pretending to be Joan’s friend—urging her to ask for a 5 percent partnership, rather than cash—when in fact he was serving only himself, hoping to conceal his financial skullduggery a few weeks longer. It made Roger look horrible: “I’m not going to stand in the way, but I’m not paying for it,” he said, marking nothing but his first refusal to pay for something all season. And, finally—and not to get all judgmental about it—it made Joan look bad. Why would Joan prostitute herself for the sake of the firm? In her conversation with Lane she suggests it’s because she’s a single mom with a baby to provide for. But we already know that Roger has offered to shoulder those costs. Why would pride prevent Joan from taking money from the father of her child, and not prevent her from selling her B-52 of a body for an emerald necklace and a 5 percent stake? We are meant to wonder whether—had the timing worked out, had Don arrived at her apartment with his dissenting vote before her date with Mr. Jaguar—Joan might have acted differently. Don believes he’s convinced her to forgo the deal, after all, judging by his shock at seeing her step into the partners’ meeting the next morning. But it wasn’t Don’s response Joan asked Lane about when she heard what the partners were considering; she wanted to know if Roger Sterling “participated in the discussion” about trading her wares. I think Joan would have gone through with it anyway. Which is something that changes the way Don sees her, and perhaps the way she sees herself. The Jaguar tagline—and Don’s spiel about it—focused on the allure of women you can’t quite own. In this episode, Peggy showed Don he doesn’t own her. Megan (who was embroiled in some fol-de-rol about an audition) showed Don something similar. And perhaps the theme offers a clue to Joan’s decision. She showed she could be owned—or at least rented for one night. But she also believed she would win herself true independence, from Roger and Greg, anyway. One thing she can no longer walk away from, however, is the firm. Let’s hope Herb the Jaguar man doesn’t ask for a repeat performance.